You’re invited to Wisconsin Lutheran Seminary’s Friends of the Seminary Day on Saturday, October 6, 2018. This annual event highlights the way your gifts help WLS support the worldwide mission of WELS. Mark your calendar today! 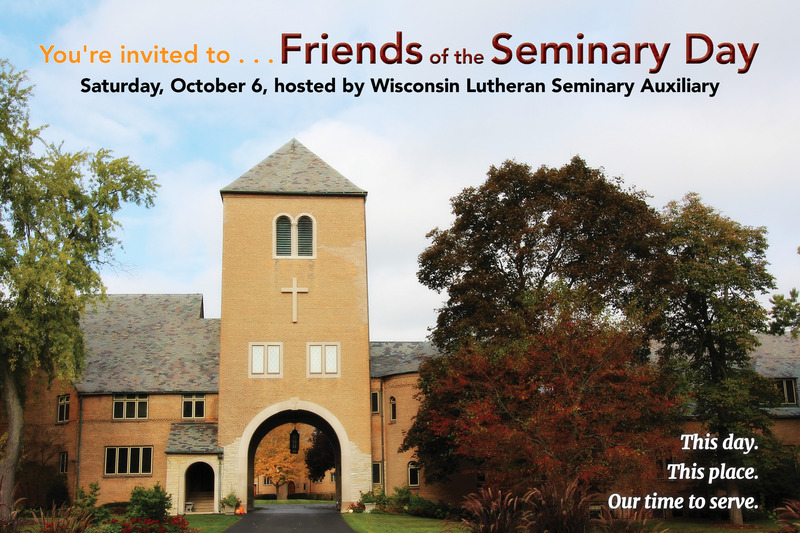 Each October WLS hosts Friends of the Seminary Day. Women and men who are dedicated to serving our Savior gather together for fellowship and mutual encouragement as they learn more about Christ’s mission at WLS. The day includes coffee fellowship, worship with the Seminary Chorus, mission presentations by faculty and students, a light luncheon, and campus tours. WLS Auxiliary encourages project and prayer support for the mission of Wisconsin Lutheran Seminary. Material projects are presented to WLS Auxiliary by the seminary. Projects chosen by a vote at the annual meeting are by the gifts of congregations and individuals. Since 1973, more than $114,600 in wish-list donations has been given by friends of the seminary through the WLS Auxiliary. Projects in recent years have included furnishings for the recently renovated chapel, a utility vehicle, video equipment, a binding machine, and gifts to the Scholarship Fund. Smaller projects are sometimes supported by individual or group contributions specifying a particular item. 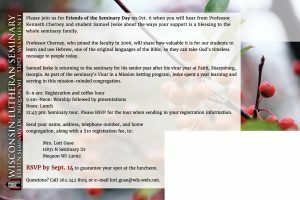 The annual meeting of WLS Auxiliary, Friends of the Seminary Day, is held every October. 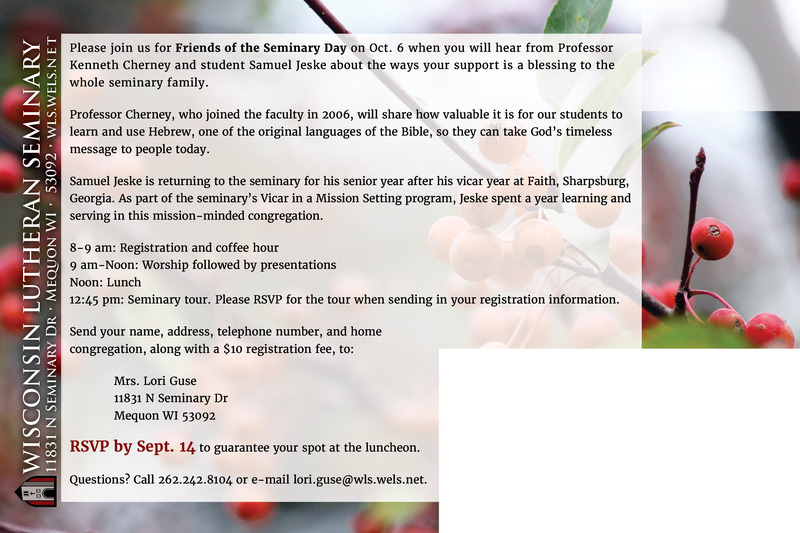 This meeting offers the opportunity for friends – old and new – to learn more about the vital mission of the seminary. Presentations and lectures highlight some of the ways our faculty and students are serving Christ’s church on a wider scale on and off our campus. For more information about WLS Auxiliary or to schedule a speaker, please contact mission advancement coordinator Lori Guse at (262) 242-8104.